American Experience The Battle of Chosin airs November 1 at 9PM on WSKG-TV. Revisit the pivotal 1950 Korean War battle through the eyewitness accounts of participants. It is a harrowing story of bloody combat and heroic survival. On Thanksgiving Day 1950, American-led United Nations troops were on the march in North Korea, and U.S. Marine and Air Force pilots distributed holiday meals. Soon after that peaceful celebration, American military leaders, including General Douglas MacArthur, were caught off guard by the entrance of the People’s Republic of China, led by Mao Zedong, into the five-month-old Korean War. 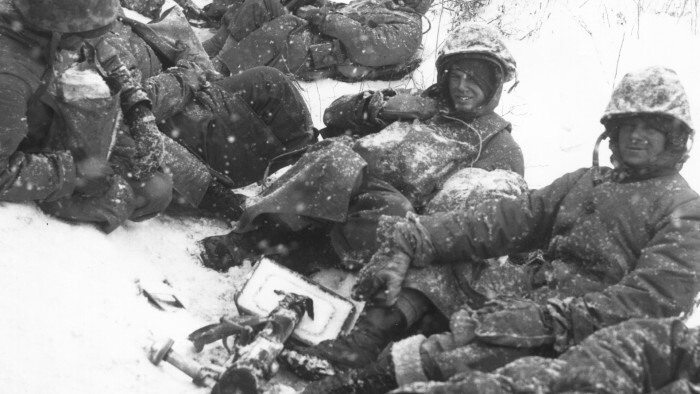 Men of a U.S. Marine mortar squad rest at the side of a snowy road during their withdrawal from the Chosin Reservoir, North Korea. (Dec. 8th, 1950). Courtesy of National Archives and Records Administration. Twelve thousand men of the First Marine Division, along with a few thousand U.S. Army soldiers, suddenly found themselves surrounded, outnumbered and at risk of annihilation at the Chosin Reservoir, high in the mountains of North Korea. The Battle of Chosin is a testament to the courage of the men who fought and survived the battle and explores the conflict in the larger context of its significance.